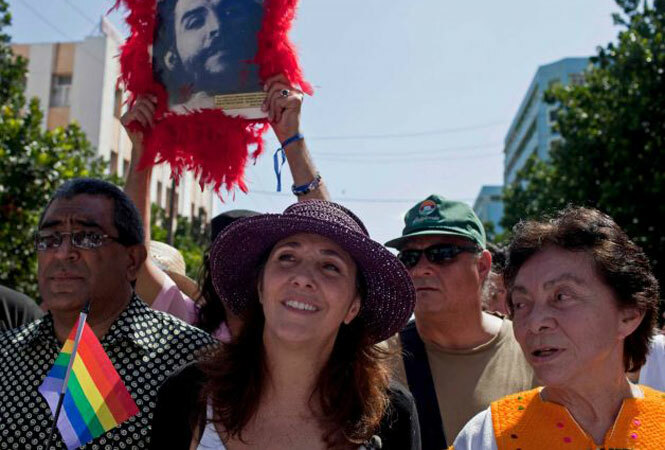 In this May 10, 2014, file photo, Mariela Castro, daughter of Cuba’s President Raul Castro, center, marches in a parade marking the upcoming International Day Against Homophobia, in Havana, Cuba. policy in parliament. HAVANA — Yet another revolutionary tradition has been broken in Cuba: A lawmaker voted “no” in parliament. And it wasn’t just any lawmaker. Mariela Castro, the daughter of President Raul Castro and niece of Fidel Castro, gave the thumbs-down to a workers’ rights bill that she felt didn’t go far enough to prevent discrimination against people with HIV or with unconventional gender identities. None of the experts contacted by The Associated Press could recall another “no” vote in the 612-seat National Assembly, which meets briefly twice a year and approves laws by unanimous show of hands. “This is the first time, without a doubt,” said Carlos Alzugaray, a historian and former Cuban diplomat. He said even measures that were widely criticized in grass-roots public meetings, such as a law raising the retirement age, had passed unanimously in the Assembly. Few in Cuba were even aware of the Dec. 20 vote until after the measure was enacted into law this summer, at which point gay activists publicized the vote by Castro, who is the island’s most prominent advocate for gay rights. Mariela Castro herself seemed to hint there could be more debate in the assembly. Others are skeptical it will set a precedent. “I would say that this is more a sign of what Mariela can get away with than a sign of what your everyday parliamentarian can get away with,” said Ted Henken, a professor of Latin American studies at Baruch College in New York. In her crusade for gay rights, Castro has often taken stands that challenge the social status quo, while firmly supporting the Communist government.